Recently, a letter was sent to the press criticizing the outgoing District Attorney and reporting their findings. This letter made it to the Dallas Morning News, where it was reported by Ed Housewright. The DMN did not publish the letter and I personally had been curious to see it. I now have a copy, and I am publishing it here. The letter came to me in a cryptic, no return addressed envelope. As I opened it up (expecting white powder to fly out at me), I saw the contents containing documents regarding the 380th Grand Jury. Contained in the letter was a request to clarify the inaccurate reporting of the impaneling of the Grand Jury. I had written about this before. In some reports, it seemed as if this grand jury was empaneled by Judge Wooten in order to investigate the District Attorney’s Office. This Grand Jury was empaneled in the normal rotation, just like every other Grand Jury. Once a Judge picks the commissioners, they select the array of potential Grand Jurors. The select between 15 and 40 people. Once that array is selected, objections can be made. The elected District Attorney can object. In this case, The district attorney had an opportunity to object on June, 11, 2010. The District Attorney in this case stated, "… we have no challenge to the array, Your Honor." c) 2 Letters from John Schulte and his wife where John resigned from service due to health issues. e) Orders dismissing one Grand Juror (on June 22, 2010) due to a prior conviction in 1977.
g) Transcript of John Roach not objecting to the makeup of the Grand Jury. "My husband is an honest, honorable man with the utmost integrity. My family has been reading the "press releases" you sent out the last couple of weeks obviously questioning these qualities. These press releases have done nothing but add to our stress over the last few weeks. You should know that my husband has not been attending grand jury sessions over the last few weeks and therefore would obviously not be involved with the "investigation" of your office discussed in your press releases. This letter also is notice to you that my husband is resigning from his service on the grand jury effective immediately due to his terminal illness. I thought a letter to you explaining the circumstances surrounding his resignation was appropriate to stop you from issuing another "press release" claiming you had anything to do with his departure. You did not." Below this post is the full Text of the Grand Jury letter. Editor’s Note: John Schulte was a friend and helped my wife and I find our first house. He was our Realtor and he will be missed. Part of the reason for my article is to help clear the air of any wrongful implications that may have been levied against him — either purposefully or otherwise. We, the members of the 380th District Court Grand Jury, July 2010 term, have completed our investigation of criminal activity originating in the Collin County District Attorney’s Office (DAO). We are providing this summary as a report to the public. Our initial concern was the motivation of the DAO in its pursuit of investigations against elected officials. After reviewing documents and listening to the testimony of a dozen witnesses, our judgment is that all activities in the DAO have been carried out with the full knowledge of DA John Roach Sr.
1. That the DAO has used its authority, and the grand jury system, to investigate marginal cases against individuals acting in both public and private capacities. 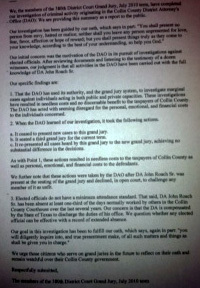 These investigations have resulted in needless costs and no discernable benefit to the taxpayers of Collin County. The DAO has acted with seeming disregard for the personal, emotional, and financial costs to the individuals concerned. 2. When the DAO learned of our investigation, it took the following actions. a. It ceased to present new cases to this grand jury. b. It seated a third grand jury for the current term. c. It re-presented all cases heard by this grand jury to the new grand jury, achieving no substantial difference in the decisions. As with Point 1, these actions resulted in needless costs to the taxpayers of Collin County as well as personal, emotional, and financial costs to the defendants. We further note that these actions were taken by the DAO after DA John Roach Sr. was present at the seating of the grand jury and declined, in open court, to challenge any member of it as unfit. 3. Elected officials do not have a minimum attendance standard. That said, DA John Roach Sr. has been absent at least one-third of the days normally worked by others in the Collin County Courthouse over the last several years. Our concern is that the DA is compensated by the State of Texas to discharge the duties of his office. We question whether any elected official can be effective with a record of extended absence. We urge those citizens who serve on grand juries in the future to reflect on their oath and remain watchful over their Collin County government.